Sherlock Holmes is a private detective with a keen eye, acute intelligence and a logical mind. Mortimer calls him the second best crime solver in Europe. He is observant, strong minded and a master of deductive thought. He is unimaginative and does not have any faith in supernatural elements. He looks at each and every aspect of the events from the logical point of view. He is never taken in any superstition. In case of Sir Charles’s mysterious death also he did not believe even the legend of the hell-hound that ran in the Baskerville family. Holmes followed his own methods in studying the case and brought out before all the fact with concrete evidences. Holmes proved that Stapleton was himself a Baskerville, the son of Sir Charles’ younger brother Roger Baskerville who fled to America with a sinister reputation. Sherlock always scans the things related to his cases so keenly that he brings out unexpected facts. In the end, it takes all of his crime-solving powers to identify an ingenious killer, save the life of his next intended victim and solve the Baskerville mystery. Dr. Watson, the narrator of the novel is a close friend of Sherlock Holmes. He works with Holmes as his agent. He follows Holmes’s methods while doing the investigation in a case. Sometimes his observations are erroneous. It is so because sometimes he would fail to have a deep study of the case and would give instant opinion about the matter. But even then he proved to be of great help to his friend Holmes while detecting a case. Dr. James Mortimer describes Sir Charles Baskerville as, “a strong-minded man, shrewd, practical and unimaginative.” He quotes from a local newspaper “The Devon County Chronicle” to prove that Sir Charles was a very generous man. The newspaper also remarks that he was slightly eccentric and that in spite of his considerable wealth, his personal tastes were very simple. Dr. Mortimer was his friend and personal physician. He tells Holmes that Sir Charles was a cardiac patient and lived a secluded life. Sir Charles was interested in science and was very knowledgeable about scientific matters concerning South Africa. Dr. Mortimer tells Holmes that the legend of the Baskerville Hound had made him very nervous and anxious a few months before his death. to death, but actually murdered. The family curse dating back to 1730 had a profound effect on Baskerville. We don’t know much about him except that he was well-respected, but had a nervous disposition. He was a potential candidate for public office for the Liberal party. The newspaper described him as a statesman, and said that “his amiability of character and extreme generosity had won the affection and respect of all who had been brought into contact with him” He was childless and a widower, but sought to look after the people of the countryside. Sir Charles kept a simple household, but had big dreams about bringing his household to its former glory. He was intelligent and shrewd, and made good money in South Africa. In the case of Mrs. Lyons, Sir Charles did seem kind-hearted because he wanted to help her and give her money to get out of her bad marriage. Alas, Sir Charles’s temperament and poor health led to his death. He foolishly agreed to walk alone at night to meet, and then was frightened to death by Stapleton’s hound. James Watson is a doctor, and he is highly observant and curious. Unfortunately, he is no match for his mentor and friend Sherlock Holmes, the great detective. Watson struggles to be the kind of detective that Holmes is. Watson is disappointed and somewhat frustrated that he is wrong in his deductions. Holmes seems to expect it, and in fact appears impressed that Watson achieved what little observation he did. Holmes does not think highly of Watson’s abilities in this area, and this frustrates Watson. Watson is eager and loyal. He is hurt when Holmes does not tell him his plans, but he always follows orders precisely. There is actually very little to describe Watson other than in bits and pieces throughout the stories. 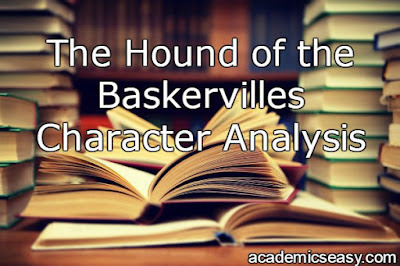 He seems to have been injured in the Afghanistan war, and may limp somewhat, but in The Hound of Baskervilles he is able to jaunt across the moor with little difficulty. He is much more uptight than Holmes, and Holmes often notes exactly how much weight he has gained so he might be somewhat slim. Watson carries a gun, and seems to physically know how to handle himself (though he is not likely as strong or agile as the once-boxer Holmes). He also smokes tobacco. Laura Lyons is the daughter of Mr. Frankland, a Baskervilles’ neighbor. She is also the woman who unwittingly lured Sir Charles Baskerville out to his death. When Watson goes to visit her, he observes that Laura is beautiful, but there is something ‘subtly wrong’ in her appearance, something that hints at a rather coarse nature. Her manner is rather abrupt and unfriendly. actually going, so that Sir Charles was left alone outside at night, where Stapleton let loose his fearsome hound on him, literally frightening him to death. Therefore Laura, although wholly innocent of any intent to murder, plays a crucial role in Sir Charles’s death. She is manipulated by Stapleton, who appears cunning and unscrupulous to a quite extraordinary degree. Mr. Frankland lives in Lafter hall. He is basically a murder suspect, though he is described as “an unknown factor”. Mr. Frankland is a neighbor. It is noted that there are not many educated men around. He is red faced, white haired, choleric and elderly man. He loves the law, and enjoys wasting his money on lawsuits. Thus Mr. Frankland is described as the comic relief. He keeps things interesting. It is also noted that he has a telescope, and a daughter who wrote to Sir Charles but never got his interest. You could consider Mr. Frankland the comic relief, or a red herring (a clue put in to confuse the reader).